Almost half of Book 4 has passed and things are looking very dire for our heroes. But, as they say, the darkest hour is just before the dawn, and I'm curious as to what should happen to Kuvira when dawn comes. I didn't create this thread just to speculate what COULD happen to her, but rather, what people WANT to see. After all, she is the final villain in the Avatar series, and I believe most of us want to avoid turning her into a giant spirit monster because hey, that'd make no sense and would alienate a lot of fans. Good thing something like that has never happened. Anyway, I believe I want Kuvira to survive. Zaheer is so far the only major villain in The Legend of Korra to survive a season, and I believe Kuvira has enough good left in her to be defeated, atone for what she has done and then continue living in peace. I'd prefer to see another duel between her and Korra, without any power-ups while the eyes of the world are upon them, almost like this week's episode but with more people observing and higher stakes. I also don't want her to slip into insanity or something along those lines like Azula; she should be a somewhat gray character right up until the very end. Sadly, the spirit vines are a thing and that'll most likely affect the final battle one way or another, but like I said, this thread is more to talk about what we want to happen, rather than what we think. Korra is going to energy bend life out of her. Pretty sure Kuvira will die by the end of Book 4,maybe she gets blown away by her own spirit weapon. Most likely, there isn't any turning back from developing a super weapon. 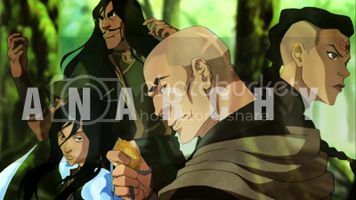 Unless Zhu Li or Baatar Junior decide to break first, turn on the super weapon, and Kuvira is the only one who can help the Avatar and her companions stop it because she is the only one who know where it is. She will be nuked from orbit, it's the only way to be sure. Yah i dont think Zhu li is THAT loyal to the Great Uniter,maybe she will betray her once she is reunited with Varrick but i cant really say. Hmm, I do think it is quite possible for the superweapon to backfire on her. But personally, I don't want her to die. By the way, just to stray off a bit, would you consider Kuvira as a powerful bender? I mean, yes, she defeated Korra in a way, but I think Korra being "rusty" was the main reason. If pre-book 4 Korra fought her, I think the results would've been different. 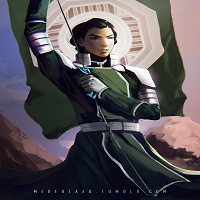 Do you find Kuvira threatening at all? I'm asking this because I am sure the way she fights off as a bender can speak a lot about her fate as a villain, too. Huh, people are only posting what they think will happen, not what they WANT to happen, as I asked. Oh well, I suppose that's alright. Yes, I'd say Kuvira is a very powerful bender. Her fighting style is completely different from that of other earthbenders, and while Korra was rusty, I'm not sure she'd be able to defeat Kuvira without the Avatar State; that sort of comes with the territory of being the final villain. Dont get me wrong i dont want Kuvira to die lol she is my favorite villain,but it seems possible.And yes she is a powerful bender,she took down all those bandits by herself that easily,took Ba Sing Se (with her army yes but still pretty badass) and defeated the Avatar,you can say that Korra was about to kill her in the Avatar State but yeah she is the Avatar it fits, only that we need her to lose this time otherwise the rest of the season would be pointless.It would be interesting to see Book 3 Korra fighting the Great Uniter but she will have it difficult without using the Avatar State. I'm really curious about Kuvira's other tricks and twists towards the end of the season. We have killer metal bands and a superweapon... What's next from the Great Uniter?! Despite 406, there's still a part of me who WANTS Kuvira to get to a moment of realization of what she's been doing exactl and end up where Azula did at the end of the Search where her mind's been opened up and you see her on the road to changing herself. One approach I think they might do that I kinda don't want is she'll conveniently need to pull a great sacrifice to put an end to the super weapon, but that's my bias against 'redemption by death 'plots. Oh dead Mike no, I can hear plenty of Korra fans screaming out of anger if it ended that way. I personally think shey'll redeem herself at the end of the series, this season is about forgiveness. Maybe she can help work with Su after Korra talks some sense into her? When I wrote break what I mean was "go crazy." Developing the super weapon and acitivating it insane, and Zhu Li and Baatar are the most likely ones to do because of proximity in her case and Baatar just would if he could get power from it somehow. I can see Bataar Jr. dying from the spirit weapon, but Kuvira needs to be taken down one on one, no avatar state by Korra. Hell, it'll be even more awesome if Korra is worn out from fighting an army or whatever, and she still pulls it out ON HER OWN. Kuvira has a lot of war crimes on her, and that duel in the latest episode implied she was going to kill Korra. Life imprisonment at best. Death by some fashion at worse. If Sasuke can be forgiving, than why can't Kuvira? If Kuvira does get redemption, we will need a massive time skip, like Hiroshi for example, took some time to reflect. Because, these are two different shows. Not necessarily. All we need to know is what Kuvira is working for. Is she concerned about her subjects or is she doing everything for herself? If it is the former than all we need to do in order to justify a heel face turn for Kuvira is have her realize that she is harming the people she loves. a) Kuvira will be imprisioned and sent to jail. b) Kuvira will be imprisoned but it will be implied that she has a chance of rehabilitation if she wants it (much like Azula can). Su will take her in again because she needs to learn forgiveness. c) Spirit vines will go out of whack and Kuvira and Korra will team up to stop it. Kuvira will pull a heroic sacrifice so it can show that Kuvira wasn't entirely evil. d) Kuvira will go down the same way Zhao did. She will rather die and become a martyr to her cause than be saved by the Avatar. Sasuke was only pardoned because of his deeds in the war. And even then, Kakashi had to vouch for him to avoid life imprisonment. Kuvira developing a super weapon is enough to unite all the nations against her. That combined with her other crimes, the best she could hope for is prison. What I think would be awesome is if there is another fight like episode 6, Kuvira loses but is offered forgiveness by Korra (she saved her dad) as well as the Beifongs. She accepts. But BJ, who has only grown more resentful as the season goes by sees this as a weakness by his fiance, takes control of the army and a giant battle ensues where many lives are lost but the good guys come out on top thanks to the arrival of the united forces. Could we please leave Naruto out of this? Not only are those two completely different shows, but you really can't compare the quality of writing in Avatar to that manga; it's like comparing Shakespeare to fanfic writers. As for Kuvira going crazy, that's probably what I want to avoid the most. Maybe it's because when I played WoW they decided to turn all the lore characters I liked insane for whatever reason, or maybe it's just because it's a lazy way to tell a story, since you won't have to worry about trivial things such as sympathy. Honestly, I was a bit worried for Kuvira after last week's episode since she talked so casually about all the reeducation camps, but this week left me feeling like she's the perfect villain to end the Avatar series with (well, except for Amon), which is why it'd feel so tragic to have her killed. Hell, even Ozai survived, although maybe that was even worse for him. Lel, Korra is going to do like Naruto and just TNJ the crap out of Kuvira until Baatar Jr step up and take control of the deal. i dont think Kuvira will Redeem herself,she is power hungry and wants more! at this point it seems possible that Kuvira will invade Republic City or at least she will try and the only way to stop that is if Korra takes her down.Kuvira did saved Tonraq but i think the forgiveness this season goes for Bolin (Opal forgives him) or maybe Varrick with Zhu li. Kuvira will get the Zhao treatment: eliminated by her own mess. As others mentioned above, I too think that she will fall victim to an unfortunate dubstep nuke. She won't get any redemption, that's for sure.